– Large battery compartment allowed me to install 2 6volt batteries. – Added Fox bumper and landing provides great access while towing (which I always do). “When we started talking about downsizing, we considered the pros and cons of our 30 ft. motor home with two slides vs. a trailer or camper. It was nice to have all the room in the motor home, but we mainly used it for sleeping, shelter from weather, and for bathroom facilities. We do very little cooking inside as we utilize our BBQ, even for breakfasts. “We have ‘toys’ that need to be hauled in or on a trailer. We take our 1956 Chevy BelAir to car shows in our enclosed trailer. The trips to the Oregon Dunes with our sand rail and/or quads, we use the enclosed trailer or our flat bed trailer. With the motor home and the trailer we need a 60 ft. RV site. Not all places will accommodate that long of a unit. Our future plans include towing our boat to camp and fish at many of the beautiful lakes in Oregon. “We had a pickup we seldom used. A trailer didn’t fit our towing needs, so ruled it out. We looked at many campers and came down to either the Arctic Fox or the Wolf Creek. After numerous phone calls to Northwood and asking a lot of questions, we sold the motor home and arranged to take a tour of the Northwood factory. During the tour we talked with staff in each stage of construction. I don’t think we could have found more competent, friendly, and professional staff at any other manufacturer. We wanted a shorter and lighter camper to suit our towing needs so decided upon the Wolf Creek 850N. We knew it would take time getting used to a smaller unit, but it felt adequate for the two of us. It has ample storage inside, and options were available to personalize it just for us. We chose the night stand where we charge our cell phones at night. We gave up cupboard space by adding the microwave but gained a large drawer by not having an oven. We added the overhead bunk, removed the mattress pad and use it for storage. We dry camp a lot so the second battery was a nice option. We got the larger refrigerator. We have had at least two weeks worth of fresh and frozen foods in it. The shower in the wet bath is adequate for the 6 ft. man of the camper. “While the unit was being made we received pictures via email of the progress. In some of the pictures the employees were waving. It warmed our hearts to know that Northwood made everything personal while still being professional. It only took a few weeks for our Wolf Creek to be built. “We wanted to try out the camper immediately so took a five-day road trip. We decided right away that the Wolf Creek is a keeper. In the five months we’ve had the Wolf Creek, we spent a week in Medford with the ’56 for the Medford Cruise, traveled to the coast and spent four days with the sand, rail-riding the Oregon Dunes. We traveled back to the coast for a car show and stayed a week. We spent a few days in an RV park in the Rogue Valley to visit family. 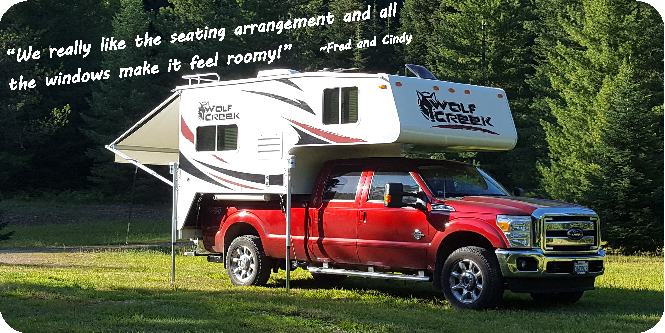 Because we love the outdoors and using our Wolf Creek, we drove eight miles from home to enjoy a few days in a campground on one of Oregon’s beautiful lakes, Lake of the Woods. Read more on Mello Mike’s Truck Camper Adventures blog.